This pumpkin wedding cake was definitely my most challenging, yet rewarding cake. Everything went perfect through the decorating process. I was so incredibly proud of this massive, amazing cake. It was literally so large that the pan used to bake the layers for the bottom pumpkin wouldn’t even allow my oven to close. That was an interesting day to say the least. I carved the large pumpkin from seven layers of cake. I placed cake boards and supports after every two layers to allow for easier cutting. 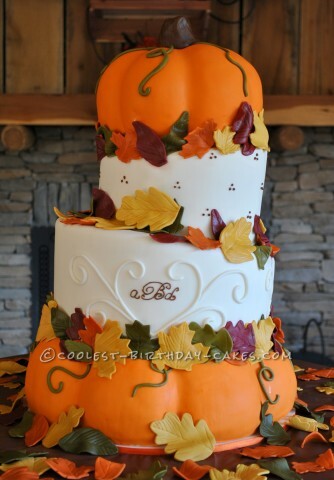 The top pumpkin is carved from five layers of cake using the same process. I placed a large dowel rod through all four tiers to keep everything together. I used cookie cutters to cut out all of the many leaves,and then left them on crinkled up wax paper to dry over night. On the day of delivery my husband, children, and myself loaded into our SUV for the delivery. I chose to ride in the back with the cake to keep an eye on it. It was to be about an hour and a half trip which I was already nervous about. Unfortunately the bride did not mention that a portion of that ride would be down a terribly bumpy dirt road. I am serious folks. Cakes do not do well traveling down a pothole alley. With every bump the leaves were falling off one by one. The stems and vines were breaking off the pumpkins. I was in the back crying and my husband was in the front crying. My poor kids didn’t say a word (quietest car ride of their lives). When we finally arrived, I got the cake all put back together (with all the groomsmen staring at me) and it ended up beautiful. My son still talks about that delivery to this day and it was three years ago. Very traumatic, but memorable.